This page is about the premium Russian medium tank T-34E. For other uses, see T-34 (Family). The T-34E is a rank II premium Russian medium tank with a battle rating of 4.0 (AB/RB) and 3.7 (SB). This tank was available for purchase before 2016, then used as an event vehicle and at this point was only gifted during the Summer Event of 2018. The feature of this tank is its 16 mm of spaced armour around its turret and sides, Which in some occasions will bounce incoming shells when angled correctly. Because of this, T-34E is often known as "the best T-34". In War Thunder, T-34E is a truly unique tank for the collector, and also very useful often outperforming other T-34s. Once T-34E is placed in the right players, they will use the extra spaced armour to effective use. Being a T-34 (1941) with spaced armour, T-34E reacts like any other low tire T-34. but stronger. T-34E, same as the other early T-34s, suffers from its weak turret. Even with the spaced armour, T-34E still cannot stop most other enemy shells. So during engagements, try not to expose your turret by hiding behind an object. Also, when T-34E is not angled, the upper frontal plate is very weak since there is no spaced armour there. So to minimize the chance to expose the weak spots, you should angle the tank 45 degrees to bounce incoming shells. With the 16 mm of spaced armour, the upper side of the tank is almost impossible to penetrate when angled. While angling, the upper frontal plate will also be unlikely for a shell to penetrate, therefore only exposing the turret. When getting hit by an enemy, some shells enters the tank, depends on the type of shells and the type of gun, the result may be very different. 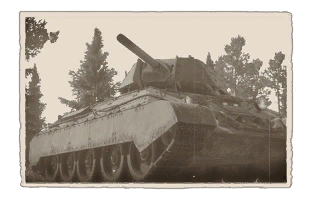 When most guns above the size of 75 mm enter the tank, you will be dead, however, those shells that are smaller with AP related shells (Armour Piercing) you will have a good chance to survive. When suffering damage and you survived, most times your gunner and loader will be dead, or sometimes the cannon breach will be damaged. Therefore you should train your crew with high repair and agility skills. T-34E has a decent top speed of 42 kph, T-34E is slightly slower than its other twins T-34 (1940) and (1941) because of its extra weight of the spaced armour. With this speed, you will be able to reach a certain position before other medium tank counterparts. To use this speed to the fullest, players are suggested to flank around the map and get side shots of enemies. The Reverse speed of T-34E is mediocre, which means that players should attempt to not overextend when attacking, or this often results in destruction. The gun on T-34E is the same on T-34 (1941) and (1942), the F-34 cannon is a decent gun at the battle rating of 4.0. F-34 offers a large number of different shells shown In this tab: F-34 Ammunition. All of the shells are useful in their own ways, but most players prefer using BR-350B, this is because of its performance in combat. Br-350B is classified as an APHEBC shell, which means that once the shell enters a tank, in most situations, will explode and kill the enemy at once. The reloading speed is average compared to other tanks in this tire, so you should avoid blind shooting just in case. Like many other T-34s, the amount of ammunition does not affect combat by much, because of the location of the ammo rack. The ammo rack is located under the loader and the gunner, which is an unlikely place for one to shoot. The T-34E has two machine guns, one located in front of the machine gunner, and one beside the gun, in game, only the turret machine gun is functional. The use of this DT machine gun is limited, with the controls being stuck with the turret, the machine gun cannot shoot aeroplanes, instead, use the machine gun to blind the enemy and sometimes shoot the open topped tanks. In-tank RB, T-34E can be used in many styles, it can be a flanker, sometimes it can be a sniper, and most times it can be a front line attacker. But no matter what style you play, always angle the armour to avoid death and remember that you always have the choice to cover the tank with decorations to further confuse the enemy.